Briefly, it is a groomed multi-use winter trail along the Sir John A. Macdonald (SJAM) multi-use pathway (MUP) that will promote active living, provide access to the Ottawa River shoreline, and welcome a diversity of users, whether they are walking, on skis, snowshoes or a snow bike. 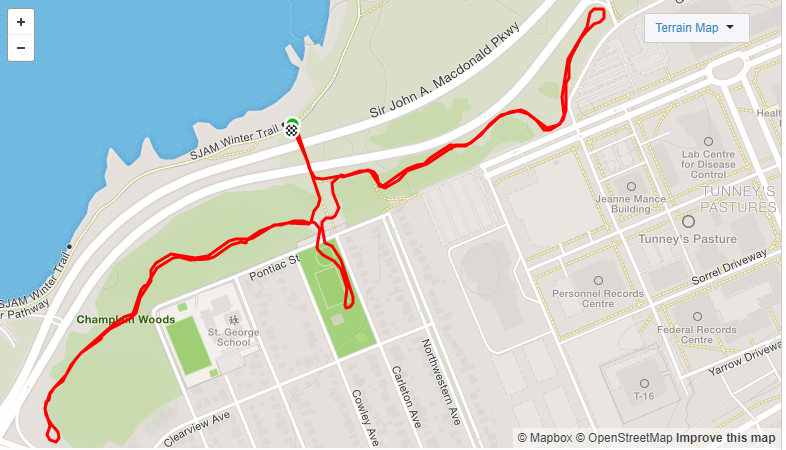 SJAM Winter Trail Composite Map as of Jan 18, 2018, created by using GPS. The SJAM Winter Trail runs from the Dominion bus stop in the west (that section not fully shown) to the Canadian War Museum in the east. 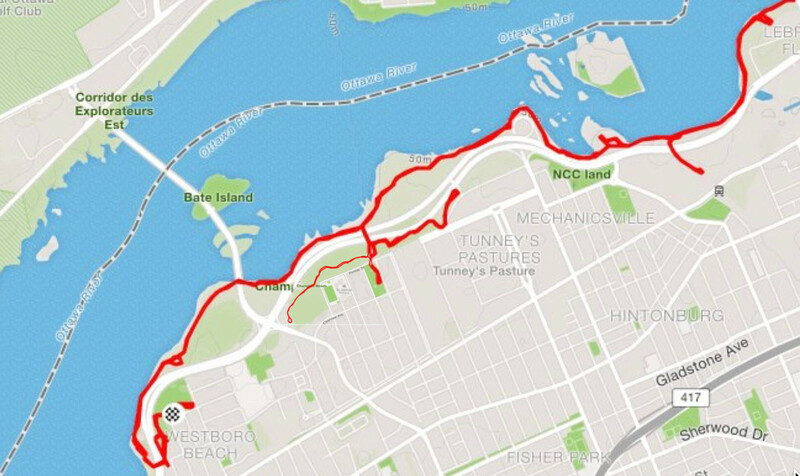 The 3.4km of trail in our neighbourhood is within the Champlain Woods buffering Champlain Park, goes to Tunney’s Pasture, and there is a little trail through the park to our fieldhouse and its washrooms. Here are some links to topics on the trail’s web site http://www.wintertrail.ca/ They also have a Facebook page at https://www.facebook.com/SJAM.Winter.Trail/, Tweet at https://twitter.com/SJAMWinterTrail and so on; see their web site for links to all their social media. The Champlain Park rink change and washroom facilities will be open during for same hours as the Out Door Rink (ODR). Now that a portion of Pontiac Street is closed (between Carleton and Cowley), Groomer Dave is able to groom the SJAM Winter Trail right up to the park fieldhouse after a meeting we held last week. Read the details here.